When we left Sigiriya we bussed the long trip to Kandy and spent a whirlwind couple hours checking out the lake and the Tooth Temple. I have to admit, most of our Kandy experience was spent in KFC. We’d been craving American fast food for weeks now and when I spotted it I nearly jumped out of my skin in excitement. As usual with fast food, the idea is always better than the experience and we left too full and feeling sick. 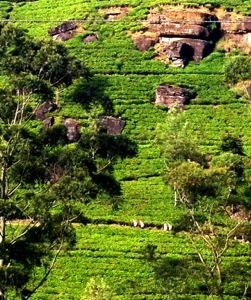 When we were done with Kandy we make the final three hour trek to Nuwara Eliya. Nuwara Eliya, meaning “city on the plain” or “city of light” is nestled in the center of the beautiful tea plantations of Sri Lanka. Its slightly higher altitude made it the perfect weather to walk around, even in the height of the day. Nuwara Eliya is considered the most important area for tea production in Sri Lanka, so Kelsi and I took full advantage of exploring the region. The next morning we were up early and on another state bus heading into the plantations. We hopped off at a plantation called Mackwoods Labookelie a half hour before it even opened. The backdrop to Labookelie was sensational. 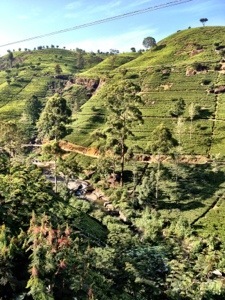 Green hills covered in rows of tea plants, small temples scattered off in the distance, and a river running through the bottom of the ravine. We watched the little old ladies walk down the dirt road with their baskets to begin work. They trudged off into the plantations to begin harvesting for the day. We sat down at an outside seating area to have breakfast. 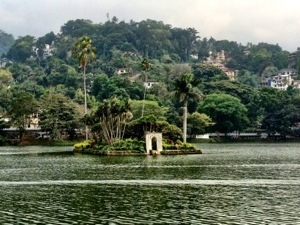 We sat, staring out at the landscape, eating the fresh fruit and yoghurt we had bought in Kandy the day before. Finally, a guy that worked there came around. “Are you here for a tour?” He asked. “Okay, come with me” he led us towards the factory. There were only two other people, an older German couple, and us on the tour. And as a bonus, the whole thing was free! For someone who drinks tea all the time, and I mean ALL the time, I actually have no idea how to make it. I don’t know where it comes from, or how different teas are classified; this was an eye opening experience for my tea ignorance. Black tea, green tea and white tea are all made from the exact same plant. Yup, probably common knowledge, but I had no idea. Only the top three to five baby bright green leaves are used to make the tea. When they are picked, they go through a drying process, the leaves are separated from the stems, fermented, and are finally broken down into different grades of tea. This is black tea. Green tea is the exact same process from the exact same leaves, except they are not fermented. Who knew! White tea, on the other hand, is made only from the buds of the plant. Each plant has a single bud on the top of the plant, and that is what is used for the tea. Five kilos of picked leaves makes one kilo of black tea. Seven kilos of buds makes one kilo of white tea. Thus why white tea is more expensive than black or green. There are a few different grades of black tea. This depends on how coarsely the leaves are broken down. The coarser the leaves, the higher the grade. The fine, dust-like powder tea that comes in the cheapest, pre-packaged tea bags is the lowest. The chunky leafy teas are considered the highest grade, and yet the midrange grade (where the tea is finely ground, and yet not quite dust) is the most favored, because of its more rounded flavor. All of these black teas are orange pekoe. Another one of my ignorant tea moments. Orange pekoe is plain, black tea. 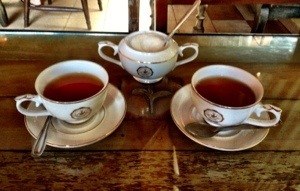 All black teas have a base of orange pekoe. If you are trying a rose tea, or earl grey, or fruit flavored, that is made by adding oils or spices as a mix afterwards. I seriously had no idea. The tour of the plantation was about a half hour. We wandered through the factory, saw the whole tea-making process, and finally sat down to a wonderful cup of tea in the tea bar. It was exactly what we wanted to see in Nuwara Eliya and was perfect timing to get back on the road. In just a short hour I had learned more about tea than my whole tea knowledge of the past 26 years! Pretty successful morning if you ask me! 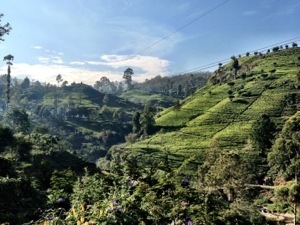 This entry was posted in Asia, Sri Lanka and tagged KFC, labookelie, orange pekoe, Tea plantations by hilarylust. Bookmark the permalink. Now I have so many more questions about teas!! !